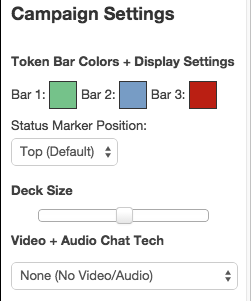 The My Settings tab, the last button on the Sidebar, allows players and GM to control several important functions in Roll20. Most of these options are specific to each Player rather than the Game, so Players can set different options to match their own preferences. By default, the Display Name is set to whatever is currently listed as your Roll20 account username. This name displays in a name plate positioned below your avatar portrait on the very bottom of the Tabletop. You can change this to suit your individual gaming needs like a specific character name or a game role. Click on the Save Name button to save any changes made in the Display Name textbox. This slider controls the maximum volume the Jukebox will play for a user. The volume level is saved between game sessions and is a per game setting. This checkbox toggles on the Advanced Shortcuts for Roll20. Select this checkbox to allow popout character sheets to remain on by default. This will “pop” character sheets and handouts “out” automatically when they are selected from the Journal. You can popout any Character Sheet or Handout manually by clicking the icon next to your Character name in the Character Window. When enabled, a beep noise will sound whenever a new item is added to the chatlog when you're not currently sitting in the chat tab of the Sidebar. When enabled, dice icons will become available in the chatlog when dice are rolled. You can drag those dice icons around to reorder the dice, and even drag them onto a map to have a Rollable Table Token of the die. 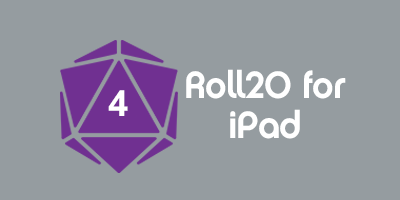 When enabled, 3D Dice will be rolled over the Tabletop whenever a valid roll is made in either chat, the Dice Roller or via Macros. When enabled, 3D Dice will be rolled automatically. Dice Agency will be turned off. When enabled, a mini icon of a user's avatar will display when chat is entered in the chatroom. If a user is speaking as a particular character, that character portrait will display instead of the user's avatar. When enabled, each chat message will be prefaced with a timestamp to show when the message was sent. Timestamps are always stored for all chat messages (since 4/13/2015). Displaying of timestamps is a per player setting which may be adjusted at any time to show or hide timestamps. Timestamps for chat messages sent less than 24 hours ago will show as only the time, with older messages including the date as well. By default this setting is enabled. Leaving this box checked will sort Token Actions alphabetically, giving you finer control over the ordering of your token actions. Uncheck this box to retain the "old" behavior where the Token Actions are not sorted alphabetically. This button will clear the chat history temporarily from the chatlog. If you reload the game, the chat history will return. These settings manage what sort of VOIP (Video and Voice chat) you want to broadcast and receive. These settings will be retained when you return to the game, so you only need to change them once. This section is only visible to the GM of a Game. You can choose different colors used for the Token Radial Menu Bubbles and their corresponding bars, see Token Features to learn more. You can also choose where you want to position the Token’s Status Indicator Overlays. You can adjust the size of the card decks on the table using this slider. This is especially useful if you have text heavy cards that need to remain on the deck when drawn, unless you specifically want them. You can set your embedded Audio Video solution here. Features listed under this category are brand new and still need testing before they’re fully integrated into a permanent place on the Sidebar. Due to this, items change from time to time under here. Often, these features are only available to those with Plus and/or Pro accounts. 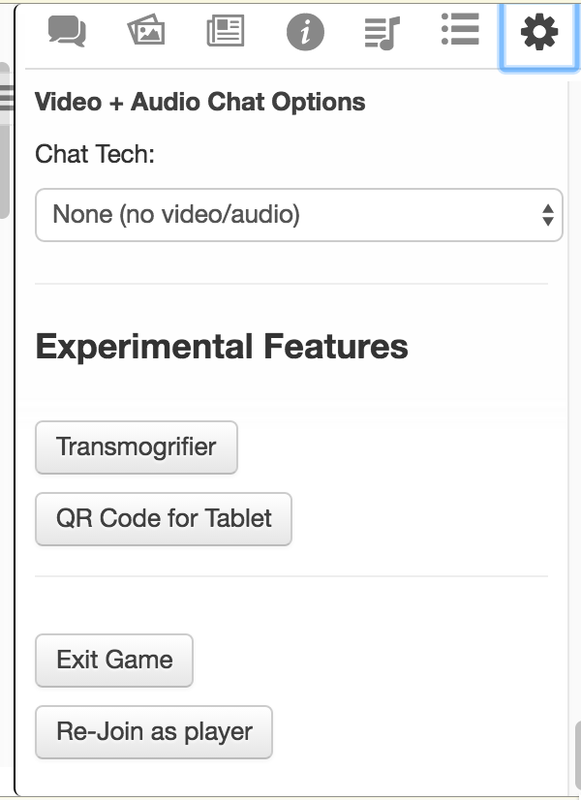 Currently, the Transmogrifier and ability to launch a "QR Code" for players to join via Roll20 for iPad and Android are experimental. Finally, at the top of the My Settings tab is a button to Exit the current game. Clicking on the Exit Game button will return you to Your Games page. As a GM, there will be an additional button either labeled Re-Join as Player or Re-Join as GM. This button allows you to exit and re-join your game as a player, useful for previewing your Game from a player's perspective or if you’re trading off GM responsibilities of the Game to one of your players. You can right click on the Re-Join as Player button, copy the link, and save that link as a bookmark to more easily and directly access the Game as a player. This page was last modified on 19 November 2018, at 13:58. This page has been accessed 107,603 times.